How do we make India’s poor richer? Before policymakers tackle India’s most important question, they need to answer two more basic questions: How many poor are there? And who are they? Identifying the poor is the first crucial step in designing India’s anti-poverty programs. Since Independence, India has used a poverty-line based approach to count the number of poor. Families below a pre-defined poverty line (called below the poverty line or BPL) are eligible for several government benefits — notably, subsidized food (through the Public Distribution system), pensions, and self-employment programs. For any anti-poverty program, the identification of eligible beneficiaries is critical: programs should only benefit the deserving while also ensuring that people in need are not excluded. For any anti-poverty program, the identification of eligible beneficiaries is critical: programs should only benefit the deserving while also ensuring that people in need are not excluded. The first part of this — when rich people have access to an anti-poverty scheme — is called “inclusion error”. The second part — where people in need cannot access an anti-poverty scheme — is “exclusion error”. A well-calculated poverty line avoids both of these errors while providing a useful metric for a nation’s progress because, with more development, the number of people living below the poverty line should decrease. Globally, countries use different measures for measuring poverty but the underlying principle remains the same — a poverty line is calculated based on some minimum level of consumption required in the country. For instance, the U.S. poverty line is set at three times the cost of an annually updated minimum food diet, and this threshold does not vary geographically. In Indonesia, the poverty line is based on the amount of money needed to consume 2,100 calories a day and cover essential non-food costs like housing, education and healthcare; but this threshold varies geographically to adjust for varying costs across regions. Much hinges on the poverty line in India, but the process for establishing this line and identifying the households falling under it has been in constant flux. The latest poverty line was calculated by the Tendulkar Committee based on a poverty line basket — the cost of a basic set of goods and services required for a minimal acceptable standard of living in rural and urban India. The basket includes both food items (determined using calorific norms) and non-food items (clothing, education, rent, etc). To determine the cost of this basket, the Planning Commission used consumption expenditure information collected by the National Sample Survey Organization (NSSO) as part of their quinquennial National Sample Survey, which typically has a sample size of over 100,000 households. The result was 270 million Indians living in poverty in 2011-12. Like with previous poverty line calculations, the Tendulkar methodology faced criticism with the main complaint being that the line was too low. In response, a new committee was constituted to propose changes. These changes had a significant impact — their re-calculation increased the number of Indians living in poverty from 270 million to 363 million. The poverty line identifies individuals in poverty; identifying households in poverty can be even more contentious. The poverty line identifies individuals in poverty; identifying households in poverty can be even more contentious. Typically, the Ministry of Rural Development identifies households below the poverty line in India through a BPL census. The last BPL census in 2002 contained 13 questions used to score households. These questions, meant to understand the quality of life for each family, covered topics on food, housing, work, land ownership, assets and education. For each question, the enumerator would select just one option, then Option #1 was scored as 0, Option #2 as 1, and so on until Option #5, which was scored as a 4. Households would receive a total score between 0 and 52, which was used to rank all households in the state. A BPL cut-off — based on the number of households considered calculated as poor through the Planning Commission calculations — would be used to identify the BPL households. In other words, the census would only show as many poor as the Planning Commission previously estimated. The cut-off for determining who was poor was different in each state, but the cut-off was usually between 16 and 25. The BPL census generated criticisms across three major categories: methodological drawbacks in identification, data quality and corruption, and data content. One major issue raised was that, while panchayats and gram sabhas recommended families for inclusion in the BPL list, these families could be deleted or replaced by higher-level officials. This made the process opaque and possibly opened it to corruption. In addition, some of the questions were criticized as poorly written or difficult to answer objectively. For example, Question 3 (above) was criticized because households in cold climates are naturally more likely to own more clothing than households in warm climates, regardless of poverty level. Question 5 (above) was criticized because it could discourage households from investing in a toilet, since that would likely remove them from the BPL roster. The remaining households are identified through a seven-item binary scoring criteria, using deprivation indicators like households with only one room, female-headed households with no adult male member between 16 and 59, etc. Significantly there is no specific indicator (like income) that suggests a family is BPL, so there is no single number that captures all of India’s poor. Rather, households are categorized according to a deprivation indicator (like not having a proper roof). This allows schemes to be targeted for each of the inclusion criteria or deprivation indicator. Significantly there is no specific indicator (like income) that suggests a family is BPL, so there is no single number that captures all of India’s poor. The Government of India advised states to use SECC data to identify poor households under the National Rural Livelihoods Mission, a livelihoods scheme, and Pradhan Mantri Aawaas Yojana (PMAY), a housing scheme. For example, in PMAY, the beneficiary family cannot own a properly constructed house to be eligible for the scheme. The rationale for shifting to SECC data is ensuring that schemes are targeted better through deprivation indicators. The government is hoping to use the multi-dimensional SECC data for identifying beneficiaries in more schemes while retaining a poverty line in India to track progress in combating extreme poverty. 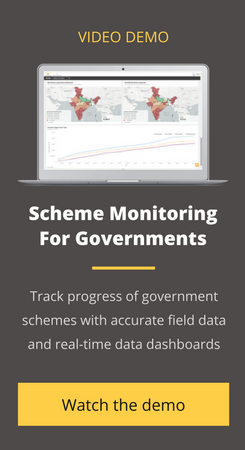 Whether the SECC results in better scheme performance remains to be seen — but it has undeniably resulted in an extremely detailed data set on rural households with rich block-level data that, if analyzed properly, could inform policymakers at all levels. A very nicely and clearly written Article. Thank you so much for the effort! !.